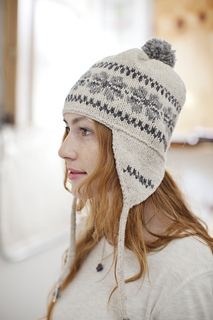 This warm winter hat plays with traditional color motifs using a muted palette of greys and white. The ear flaps, which are picked up and worked last, feature a duplicate stitch motif and I-cord tassels. Add an optional pom-pom on top for a whimsical look, or leave it off for a cleaner silhouette. Stitch gauges between stranded and one-color fabrics should match – your individual tension may require two different needle sizes for these sections of the pattern. If you’re unsure, make a couple of quick swatches to check your gauge. Note: You may require a slightly larger needle when working colorwork to achieve matching stitch gauge. We recommend swatching to check your gauges.